A band Canada is proud to call their own: Hedley dishes on what it’s like to keep a balance in their lives—not easy when your lives are constantly displayed on a stage for everyone to see. 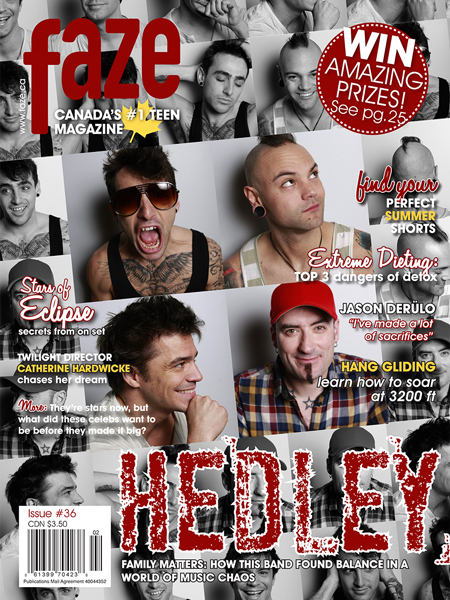 Go behind the scenes at the Faze Hedley cover shoot! Should the government ban anyone under the age of 18 from using tanning beds? FOR FUN: What is one thing you’re really looking forward to this summer? The First Cut: Self-injury among teens is on the rise—what’s behind this alarming need for pain? Want To Win A Cool Summer Vacation? Check out our South Beach contest! QUIZ: What’s Your Celebrity Eco-Identity? Styling by Laura Di Marcello. Makeup by Esteban Ortiz. Styling assistance by Natalie Naccarato and Kristyn Pereira.